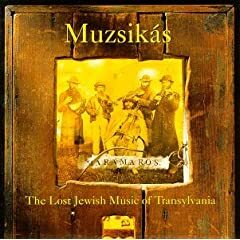 The CD features old-time violinist Gheorghe Covaci and cimbalom player Arprad Toni, gypsy musicians who had regularly played in Jewish groups before the war. According to Muzsikas these players are one of a very small number of surviving links to a whole Hungarian-Jewish tradition of playing that got decimated during the war. Together they attempt to recapture what that music would have sounded like. Hungarian folk-music is normally my least favourite of all the Eastern European folk traditions (which means I still like it, but not as passionately as other regions), but probably because of the klezmer influence, this disc has some very special music, of both the hauntingly mournful and the foot-stomping varieties. Some of New York's best chamber players have been corralled by the energetic young conductor Andrew Cyr to form the Metropolis Ensemble. They've just announced their spring concert which will take place this April 10, in another great looking American venue - the Times Center, part of the New York Times building designed by Italian architect Renzo Piano, and situated in the heart of the Times Square District adjacent to The New 42nd Street. The concert will end with my arragement of Satie's Sports et Divertissements specially commissioned by the Ensemble. They are a wonderful set of pieces, and I think and hope the orchestration adds an extra layer to their wit and colour. More info on the Metropolis Ensemble website.